Learning Dark Arts: August 2009. This would appear to be the final look at role-playing game artists for a while again. Last but certainly not least, Palladium has in its newer crop of artists the very talented Mike Mumah. Like the last two artists Mike has some art in Dead Reign. Most of them are very clean line art with something of a minimalist take, where only the lines necessary are present and no shading is used. These pieces have dark objects like clothing and shadows in sharp flawless black. A couple show comedic movement and, a certain playfulness in contrast to the dark subject matter. All of them have good detail. One picture on page 76 is a stand out piece of digital art in smooth greyscale--in contrast to some colour digital art that Palladium has had greyscaled to the images' detriment. This particular image from Mike has a very Tom Savini-esque biker ready for some zombie bashing. As a matter of difference this art has blending to make a chrome-like sheen to parts of the motorcycle as well as shading. It is surrounded by a couple of well-merged sunburst gradients--one from the headlamp--giving a sense of light in the darkness as well as focus on the rider. This picture is reminiscent of Mike's work for the special summer Swimsuit issues of Palladium's The Rifter. Rifter 39 on page 6 has an amazing femme fatal with a katana and cybernetic arm. It has good lighting represented complete with shadows. Mike's other contribution is a graceful mermaid on page 28 that shows excellent movement and emotion. These are just Mike's most recent work in this style. Music: T.V. Wife by Twisted Sister. Tags: blend, Dead Reign, gradient, greyscale, Mike Mumah, Palladium Books, The Rifter, shadows, Tom Savini, zombies. The Palladium Books role-playing game "Dead Reign" is a horror-beautiful book that deserves more than one mention. A huge reason is the art of Amy L. Ashbaugh. Most of Amy's art is line drawing with crosshatch work. A couple of pieces though have an almost charcoal style of look to them in parts. Her art here is very atmospheric and perfectly suited to the game. At the same time it informs the game's mood. Many of the pieces are very dark with a thick, deliberate style of crosshatching that must be very time consuming. Looking through the book, all of Amy's art is full scenes, from idyllic scenic pieces to action scenes--as opposed to character portraits or other illustrative art pieces without backgrounds. She has a definite eye for telling a story within a single image. Amy's art is finely detailed, with a realistic aesthetic even with respect to the fantastical elements. Some zombies are more representative than accurate though, but still stray away from comic bookish or anime-like. Some pieces are quietly horrific and evoke through insinuation, others are directly gruesome, and a few elegantly disturbing. There is a lot of her work in the front half of this book, with the bulk of the descriptive bits defining the setting. It is hard to pick a favourite example. One of the most evocative is on page 28 where a slim, desiccated zombie stands dormant, eyes closed, in a dark room between a tall chest of drawers and a stack of boxes with a lamp on top. It stands, waiting to be disturbed, to feed on the life energy of the living. It is great example of the power in simplicity and understatement. Music: Return of the King by Bruce Dickinson. Tags: Amy L. Ashbaugh, cross-hatching, Dead Reign, disturbing, Palladium Books, realistic, role-playing games, scene, story, zombies. Today's artist, like most of the others, also works with Palladium Books. His name is Nick Bradshaw. He informs me that he is not the same one doing the Army of Darkness graphic novels. That Nick Bradshaw is apparently Canadian; go us. Palladium's Nick Bradshaw really came to my attention with Rifts World Book 29: Madhaven. There is a certain throwback quality to Nick's work in there hearkening back to my favourite pieces by Larry MacDougall. I'm specifically noting the tattooing on many of the creatures, which can best be described as almost typographic, like alien lettering. These tattoos are not the only markings on these figures. There is also a lot of mottling and other detail to Nick's work. The attention to detail is fantastic. The art is gritty and gruesome as needed. When Palladium announced it's zombie apocalypse game Dead Reign and Nick's name was in the promotion it was certain there was going to be some cool gristle and grit. The release of the game did not disappoint. 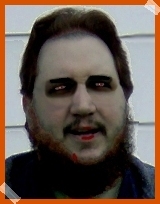 Nick has an image for the zombie type referred to as Crawlers (pg 41) that is the epitome of wicked. It's the most graphic picture in the whole book and that is saying something given the most rotted, most muscle exposed and pieces-missing, zombies are his work. Nick also has non-zombie pieces, which show the same excellent down, dirty, and beaten up aesthetic that fits so perfect with the game. The switch to the living and the mechanical or scenic carries modifications to his style, and exemplifies the breadth of his artistic talent. Music: Zombie Stomp by Ozzy Osbourne. Tags: Dead Reign, gritty, gruesome, Larry MacDougall, Madhaven, mottling, Nick Bradshaw, Palladium Books, Rifts, zombies. Today is a holiday in Canada. Enjoy the time off and I'll be back next Monday with a new article.